Two Posts so Close together? So I’ve known for some time I needed to get a Title Page done for Dark Horse Act 3: The New Deal. Back when I’d first started this comic, I’d drawn out something heavily inspired by Sailor Moon, in that it was cutesy and had like star mint candies in the background. 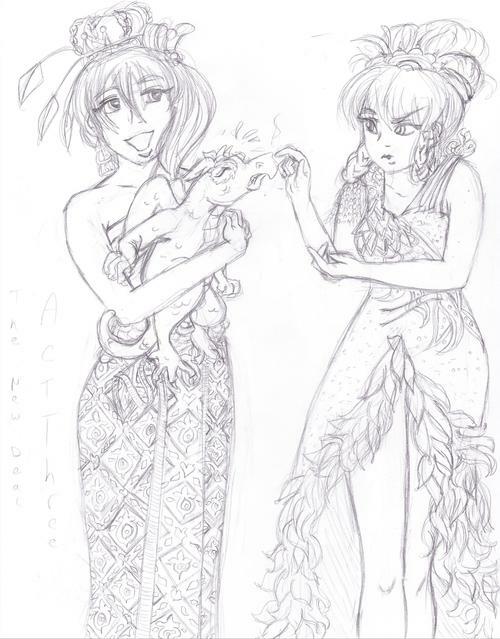 I had Rhina holding Odysseus in his dragon form, and Kanna like with her arm around Rin’s shoulders, petting Odysseus. I can’t find this TERRIBLY rendered image now, but if I find it, I’ll scan it in and post it for a comparison. Well, I wanted to keep the same idea…but Kanna really isn’t cool with the dragon. She’s still kinda wary of what he is (uh…rightfully so, but Rin’s an airhead, so she’s all at it.) I thought it’s be better to express this in the title page. And, for the hell of it, cool Asian clothing! This time not Indian themed. I think Rin’s dress is more Thai (can’t tell…I got the idea from an advertisment sent to someone at work and it didn’t say the inspiration) and Kanna’s dress is like a Chinese dress I found online. Made Kanna’s hairstyle up because I didn’t like the Chinese lady’s hair style, which looked like a 1980s Duran Duran model. Nothing against that, just not what I was going for. So here’s the sketch I came up with! Please let me know what you think!